Notice that the word church is on the outside the window. This is a profound illustration of the subject matter. The centerpiece of the painting is the perfect structure of a church window. These panes of multiple colors each tell a divine story representing some deep aspect of life. Yellow is for family or genealogies. Red is for the blood. Blue is for salvation. Green is for growth. Orange is for blessed. 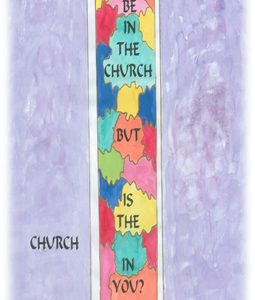 This piece can be displayed at your church or in your home.